I was lucky to have friends and colleagues telling me their fishing stories from Slovenia. I had planned a trip there for almost a year, but never managed to go due to different urgent matters that would pop-up. It’s a shame, I live in Vienna, just four hours drive from most of the Slovenian salmonide waters. This time, I planned my trip much better. I decided to take Friday off and drive to Slovenia. The problem was still “which rivers do I fish”? I heard a lot of stories about Tolmin area, within the beautiful National Park of Triglav. There flows the most beautiful river in Europe, Soca. Soca and its tributaries provide with excellent fishing opportunities for Marble Trout and Grayling. The next option was Sava Bohinjka and Radovna river, just at the Lake Bohinj, another touristic attraction. Then, in my mind was also the river Idrijca, known for its difficult fishing but also for its giant fish. Decided to take a guide for two days, so went through the list of all Slovenian guides. The one I liked was the guiding company of Mr. Rok Lustrik. Woke up at 6 am and the lightening had stopped, but the heavy rain not. After breakfast we meet Luka as initially agreed. Luka, being a very professional guide from the area, was very well aware that after such a heavy rain and storm, there will be almost mission impossible to fish the Soca river and its tributaries. However, we agreed to have a look and we noticed that most of the tributaries were muddy, or in the process of getting muddy. Soca was getting very high, so our guide proposed an alternative. That was certainly Idrijca river. Honestly, I was not happy with its choice, but the problem was that there was no other choice that required up to one our drive from the place. I explained to our guide Luka that I heard so many stories that Idrijca is a very challenging river, and that I am not a professional fly fisherman. Luka just laughed to that and told me not to worry. Ok, we headed up to Idrija town and just outside it there was a beautiful small restaurant, with a nice terrace and excellent food. We bought our daily cards and went straight to the water. The water was still clear but a bit higher than usual. We tried to fish with dry fly but had no results, so we immediately switched to streamers since the water was getting higher and higher, and also its visibility was getting worse. Not even 5 minutes passed, I had a beautiful brown trout, over 40cm big. Removed the fly carefully, took a picture and released it. I asked Luka to grab his rod and fish as well, otherwise your guide will not fish himself if you do not ask him to. While Luka was setting up his rod, I had another fish, this time a hybrid (a mixture of Marble and Brown trout). Again a big exemplar, around 45cm. After couple of minutes, Luka also landed a very good trout. So, next morning we met with Luka at the Café/Restaurant which serves as a fishing lodge. There were already two fisherman in the water and Luka told me that they didn’t catch a fish yet. We met with Danilo, the President of Idrija Fishing Association, and we had our morning coffee together. Went immediately to the river and started again at the spot we started day before. Now, the water was gin clear and also much lower, fish very spooky but from time to time raising up for flies. There was a morning hatch which didn’t last very long, however we enjoyed fishing on dry flies. I caught two beautiful rainbows before switching to nymphing. Walking upstream in shallows, Luka asked me to cast upstream, almost at the shore. After few tries, he just told me not to move since there is a huge fish just 2 meters far from me. I turned to my right carefully but could not see the fish. Usually I am the one who can spot the fishes and show them to my fishing friends, but this time it was the opposite. Despite of my concentration and all efforts to see the fish, I could not see anything except the stones. Luka said that this is a huge grayling and asked me to cast just in front of the fish. I did some of blind casts and had nothing. Luka told me that I was slow once, the fish was on my nymph. I had enough of this grayling so I asked Luka to give it a try. I told him, YOU SEE THE FISH AND I DON’T, so better you try it. After 4-5 casts, something very big was hooked, Luka was walking down the river with the fish until he brought it to the shallow and calm part of the water. It was a very big grayling, a beautiful one. Continued upstream with the same type of fishing but I was unsuccessful. Obviously blind casting in that shallow water where you easily can see fish was not my thing? Continued further up and had couple of more trouts, but the time to go back to Vienna was approaching, so Luka suggested to visit one more spot which we did not visit day before. We went there and we found two Italian guys fishing. Just 50m down from the spot they were fishing, we could see a huge marble trout of 1 meter, as well as many other huge trouts. Made couple of casts and had a good hybrid. I told Luka that we should be going, so we packed our stuff and went back to the restaurant for a nice lunch. I have to say, I am looking forward to go back to Slovenia again. I was impressed with the waters, fishing, area and the guiding services. 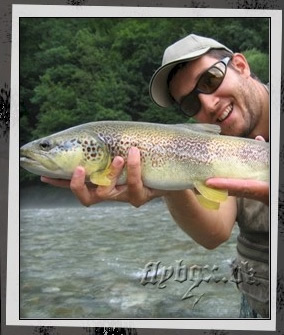 To those who did not have a chance to fish in Slovenian waters yet, I would highly recommend them to do so. I would recommend you book a guide at least for the first day/s at www.lustrik.com . It is not easy to find all the hot spots on your own. Again, if you have a chance to visit Slovenia, pack your fly rod with you as well, Idrijca, Soca, Sava Bohinjska and many other rivers provide excellent fishing opportunities.